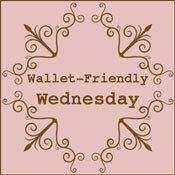 Bargain Shopping Paradise: Wallet-Friendly Wednesday: back next week! Wallet-Friendly Wednesday is taking a break this week. I apologize for not being "with-it" enough to get a new post up this week. Plan ahead, and come back to share your wallet-friendly ideas, deals, etc., next week on April 27, 2011.